Today I'm up on The Twinery blog with a Mother's day tag! Head over there for all of the details! Earth Week with The Twinery! Hello friends, I'm finally back today to share a fun, up-cycled project for Earth Week! Head over to The Twinery blog to see more more fun projects the DT is sharing this week! We recently had some work done on our house and had some leftover pieces of board and paint which I just couldn't let go to waste! I cut a piece of the board to measure 5x7 and then painted it the robin's egg blue. Once that was dry, I added a layer of white paint on top, let dry, and then sanded it to rough up the edges and let the blue show through. I think I made the layers a bit too thick because I had to put in some major elbow grease to get that blue to show through! Once sanded, I distressed the board with a bit of dye ink. I wrapped the edges of the board with Solid Caribbean twine and added some Solid Cappuccino as an accent to the front of the piece along with some fabric flowers. I am planning to use this as a photo frame but love that it can be used for other things as well, a frame, the base of a collage, you could add some chalk paint for a little sign, or keep it as an art piece, as-is. Hello friends! Today I'm up on The Twinery blog showcasing a fun project using DecoFoil! Head over there to see how I did it! 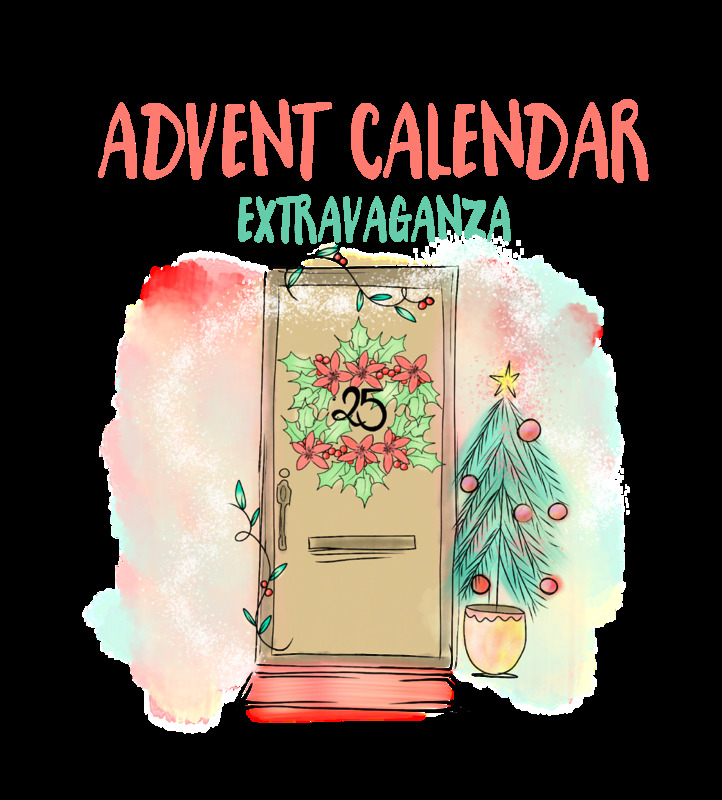 Advent Calendar Extravaganza is -the- festive event of the season! This ‘hop with a twist’ was dreamed up by Taheerah Atchia and features surprise destinations each day! 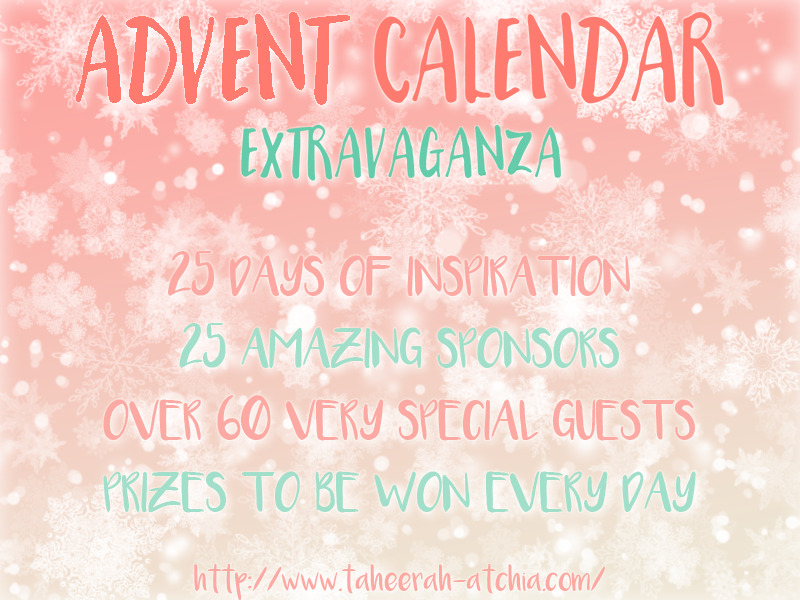 Joining in the fun with Taheerah are over 60 special guests - each serving up some fantastic Christmas inspiration! Just like an Advent Calendar, you’ll never know where you’re going to be visiting next until you ‘open the door’! And that’s not all! 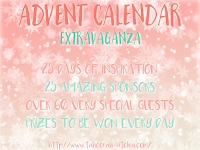 With 25 *amazing* sponsors taking part as well, your crafty wish list is bound to get a boost with a chance to win a prize EVERY SINGLE DAY!! 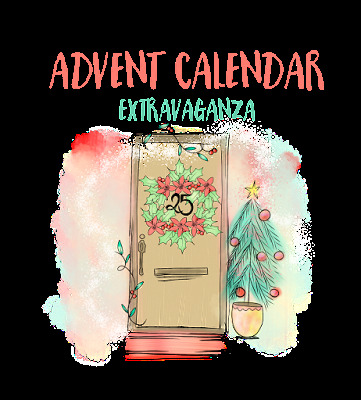 Join in the fun every day at taheerah-atchia.com to see what special surprises wait behind the door! Today's sponsor is Waltzingmouse Stamps! I designed for Claire and the team for years and it was a wonderful time! I'm thrilled to be presenting along with her today! For this card, I stamped a WMS striped background stamp onto a sheet of vellum using silver ink and layered in on a kraft card base for a subtle look. I stamped and fussy cut two rendered and then layered them on top of the vellum and used some metallic brads for their noses. I finished the card with some twine and a stamped sentiment greeting. In order to win the prize supplied by Waltzingmouse Stamps, simply leave a comment on this post to enter - then head back to taheerah-atchia.com and leave a comment there too to double your chances! Don’t forget to grab the other surprise destinations from Taheerah’s blog and head over to them to leave comments there as well to improve your odds even more! You have until 7am EST on Thursday 31st December to leave all your comments! Hello friends! I'm up today on The Twinery blog with these fun pocket tags. Please head over there for all of the details! Hello friends! Today is a fun blog hop with some of The Twinery designers as we show you how we store our twine! 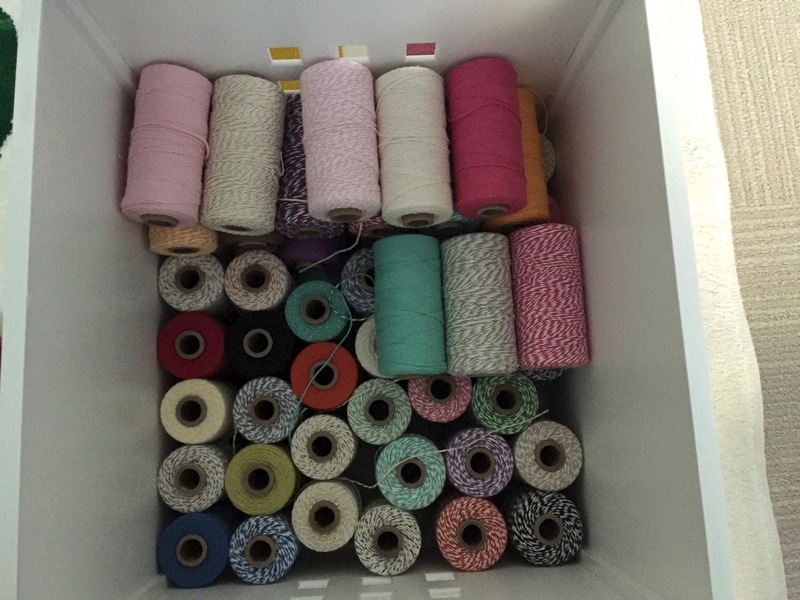 I store my twine in this Kallax shelving unit from Ikea and I just adore it. The drawers also came from Ikea and they are huge - perfect for storing all types of things. You can see by the labels that this one has my printing supplies in one drawer (for my Selphy and my regular printer), my glitter and Stickles in another, some new paper collections in the third and my Twinery twine in the last one. It really is so perfect to store, deep enough to dig around in and close to the ground because it is heavy! 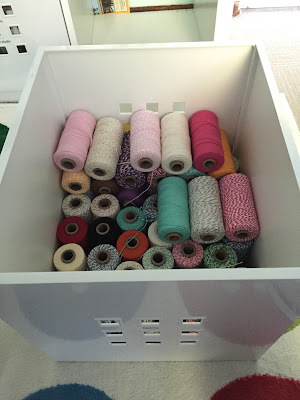 I have larger sizes of Kallax in the closet of my craft room and they hold so much stuff! I really can't say enough good things about these storage cubes and the little drawers I got for them. Like I always say, it's not really a hop unless there's a prize and we've got several to give away today! Each designer participating in the hop today will be giving away a Striped Twine Sampler ($18 value). 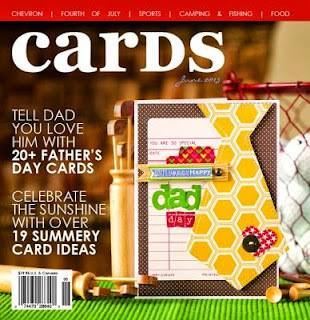 To enter, hoppers need to comment on each post along the hop and, since each designer is giving away a Striped Twine Sampler, each post commented on is another chance to win! Comments will close at midnight (EST) on Tuesday, November 3rd and winners will be posted on The Twinery blog on Thursday, November 5th. Also, just for the hop today, there is a special 25% off discount on any order! Fabulous! Simply use the code STASH25 through 11/6. In closing, I thought I'd share the reason you don't see me out in craft land regularly any more (though I really am trying to remedy that!) - baby Amelia! I don't think I've shared a photo in a long time and she sure isn't a baby any more! 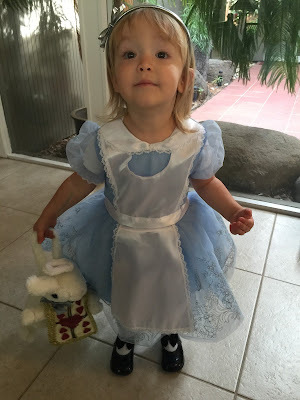 She turned 2 in September and started preschool. Here she is trying her Halloween costume on... I know I'm biased but I think she's darn cute! Here are all of the designers participating today. I think you'll enjoy all of the storage ideas they'll be sharing! Hi friends! 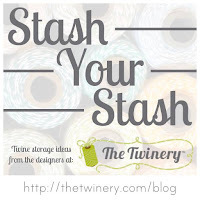 I'm up on the Twinery blog today with a fun project. I hope you can head over for all of the details. The photo above is just one part of the ensemble!